Early Uncut Sheets of Private Bank Notes from the New Orleans Canal & Banking Company printed in the 1850's. Early Uncut Sheets of Private Bank Notes. 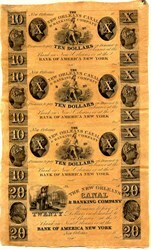 The New Orleans Canal & Banking Company 3- $10 & 1- $20 Notes Uncut Sheet Dates around 1850 "promises to pay Ten (Twenty) Dollars on demand to _______ or Bearer at the Bank in New Orleans or at the Bank of America, New York"